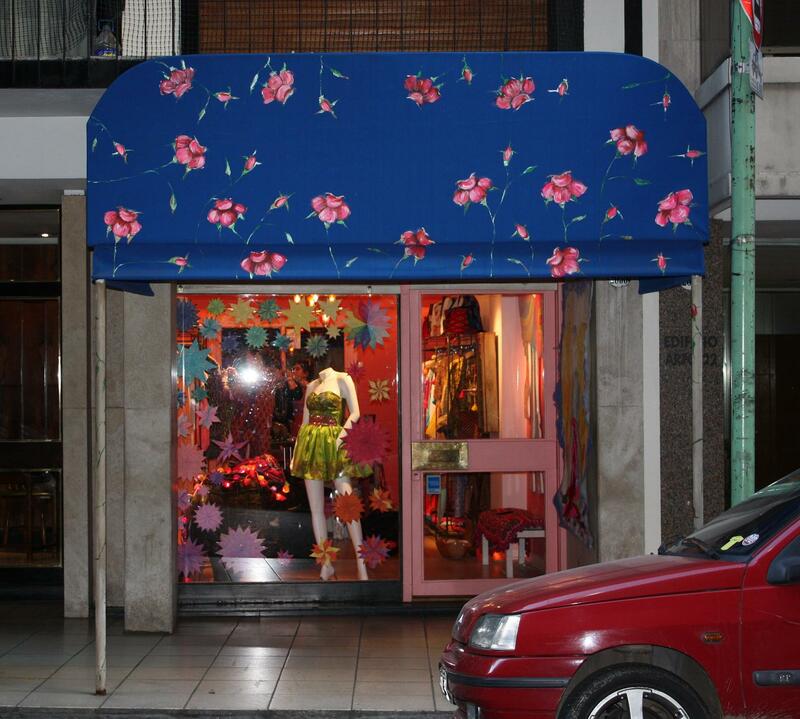 Vibrant, blue-collar La Boca and bohemian San Telmo are among the neighborhoods most often touted as B.A. must-sees. I set out this morning on foot to add them to my mental scrapbook, retracing much of yesterday’s route to the Micocentro and past the Puerto Madero warehouse/marina district. I’d otherwise bypass the crowded, cheesy pedestrian mall along Lavalle and Florida, but it seems like the place for a guaranteed score of the sunblock and cheap hat that are today’s first order of business; yesterday’s light breeze and balmy 70’s temperatures lulled me into a suspension of disbelief that December in B.A. = June in Dallas and I awake this morning just one stop short of a full-blown sunburn. Bu the time I pass the Casa Rosada temperatures are pushing into the 80’s and at mid-day there is no longer a shady side of the street. I apply my sunblock and dodge beween porticoed sidewalks and shaded parks still in search of a full-brimmed hat. As I pass Independencia headed southbound on Defensa the mid-rise buildings shrink to a more human scale and the architectural clock turns back a good 50 years. Block by block, hip little shops begin to outnumber graffiti-covered vacancies, and in one of them I find a straw-colored fedora in tightly woven cotton with a breathable mesh crown, impeccably stitched. The price of this little item in the States would start at US$50 and could easily run double that, but here it costs US$20 and change. This place is turning me into a sale-a-holic and it frightens me, since I normally refuse to shop for clothing until something in my closet has disintegrated beyond repair. In fact, were it not for the internet, my fear of retail clothing stores would have turned me into a nudist years ago. But I digress. 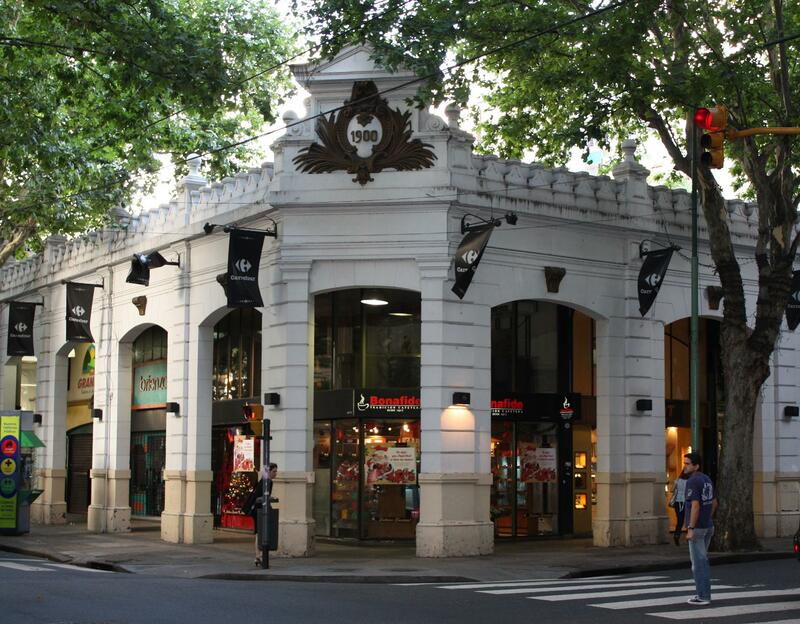 Only a couple of blocks past the hat store I find it: A little gem of a square called Plaza Dorrego. Restaurants on each side have carved out their fiefdoms of umbrella-covered tables, and chalkboard easels present their bills of fare. I’m guided reluctantly to a table that seems too far from the photographic action, but the waiter – only the third black man I’ve seen in the entire city in three days – is forgiving of my paltry Spanish and graciously steers me through the menu. Just when I fear that I may have become terminally beefed-out in this land of the gaucho, it leaps off the menu at me in a forehead-slapping moment: CARPACCIO! This one comes under a mountain of fresh spinach and a grated local queso blanco. I round out the order and pull out a map to check my bearings while I wait. I should have seen it coming, but I am too engrossed in the passing sight of a shapely, dark-haired, dark-eyed young woman in a tight-fitting, bright red, calf-length skirt slit almost to the bikini line in several places. As she passes into no my-longer-looking-but-ogling range, I shift my gaze to an interesting character who has stepped to the center of a clearing among the tables, carefully picking and preening a double-breasted, pinstriped burgundy suit that looks like it came straight out of the wardrobe of a production of Guys & Dolls. Suddenly tango music begins and the pair walks slowly and deliberately toward each other from opposite ends of the clearing until they are locked in an inseparable embrace. Their expressions are frozen and their backs ramrod stiff. He seems to pivot right and left from the backbone, legs rotating like axles from somewhere below the hip. She wraps herself around him again and again like a banner flapping in the wind, long legs hooking around him hip-high before sliding down him like he was a greased pole. The footwork is delicate and yet rapid-fire, leaving no more than millimeters between them and a nasty fall… or a painful knee to his crotch. 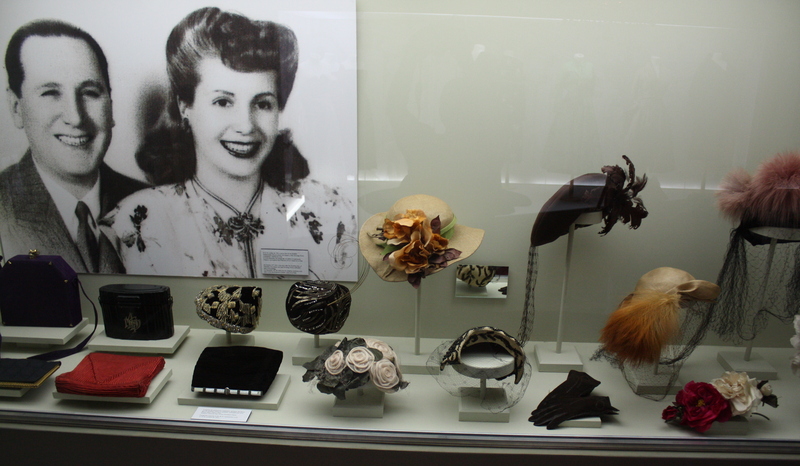 The entertainment ends to a round of roaring applause and the young lady walks her partner’s hat among the tables for tips. My cool peach liquado arrives and not a moment too soon. Then comes the carpaccio salad along with a side of empanadas that somehow crept into my order. In other countries, these come stuffed with your choice of just about anything imaginable, but here in B.A. the menu says simply “empanadas” because – you guessed it – they come only in beef except otherwise (and probably at peril of your life) specified. In other countries they’re also known to arrive deep-fried, but this baked crust is such a work of art that for a moment I’m actually embarrassed to wolf it down. It looks like it was crimped by French pastry chef and it’s golden brown without a burn mark anywhere. I bite into it and it’s flaky throughout, which is amazing since the steaming juices from the minced beef are sealed inside. Argentina is clearly seeping much more quickly into my consciousness than I had ever thought possible: I’ve now managed to find a way to eat beef for two courses of the same meal. Dare I next attempt a trifecta? Call it ghoulish if you like, but cemeteries have become a must-see item on my foreign travel itineraries. It began a few years ago with a visit to the incomparable Père-Lachaise Cemetery in Paris, and I won’t lie to you: I didn’t go there to see the graves of Molière, Modigliani or Proust, but rather the grave of Doors front man Jim Morrison. An important lesson learned there, though, stayed with me. The world’s great cemeteries are time capsules, and through their architecture and inscriptions we see not just those buried there, but their cultural and family context. 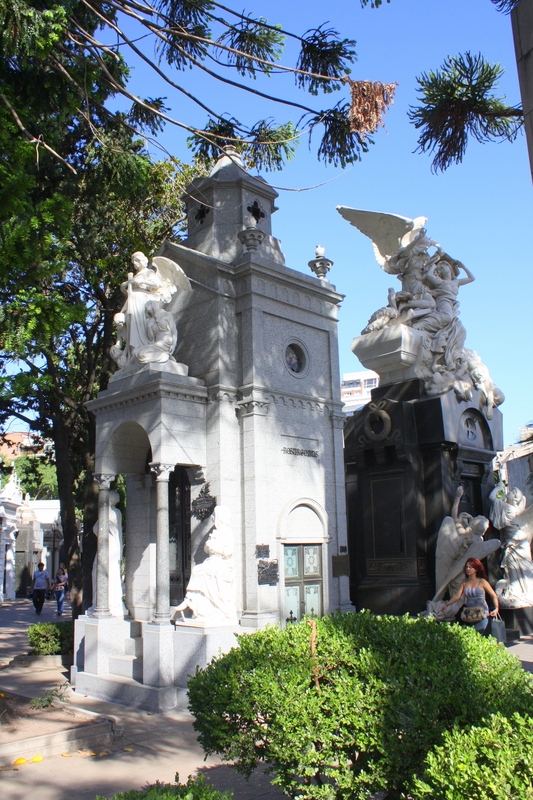 La Recoleta Cemetery in Buenos Aires is more than the burial place of Argentina’s beloved Evita. 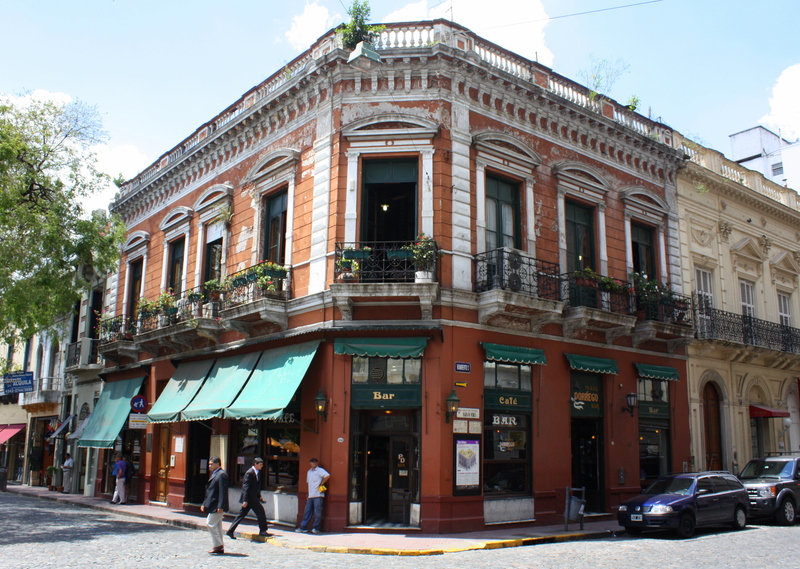 It is a snapshot of the city’s coming of age in the late 19th and early 20th centuries. 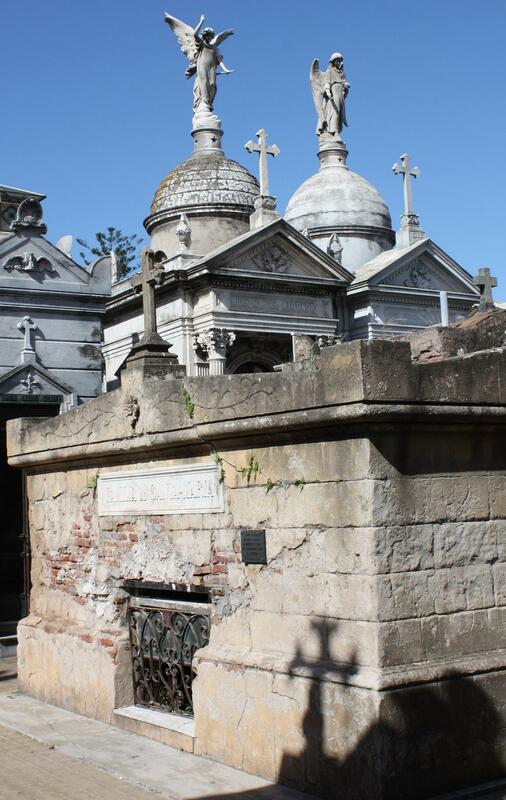 Like Père-Lachaise, La Recoleta is an urban cemetery chock full of notables. Unlike Père-Lachaise it is compact in every sense of the word. Most of the burials occurred in 50 years or so beginning around 1880 and there are no expansive spaces here; only mausoleum crypts packed cheek-to-jowl in a style very reminiscent of New Orleans. With few exceptions the architectural styles are similarly confined to themes and symbols prominent around the turn of their century. 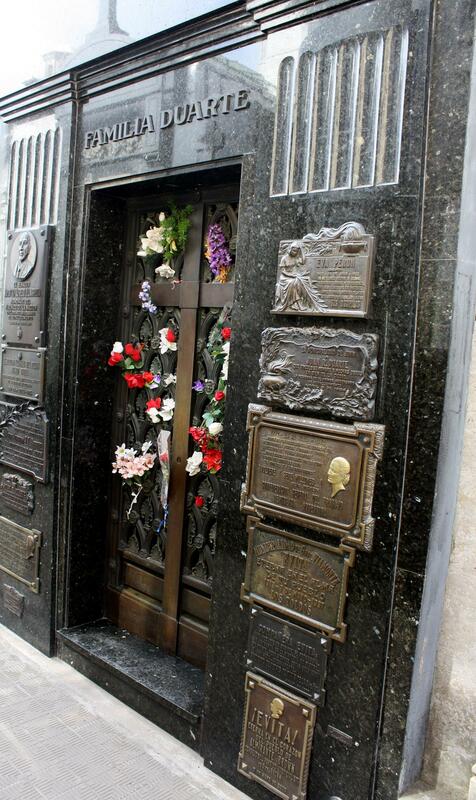 As with Jim Morrison’s grave, the Duarte family crypt containing Eva Perón’s remains is quite modest. Also as with Jim Morrison, Evita’s celebrity overshadows those of others as highly revered and in their own ways at least as accomplished, including boxer Luis Firpo, the “Wild Bull of the Pampas” best known for his celebrated bout with world heavyweight Jack Dempsey. 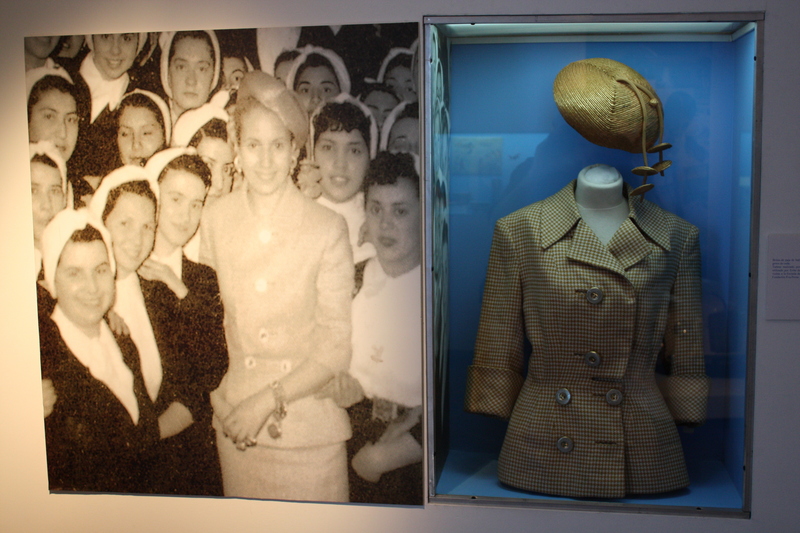 Evita has a plaque; Firpo has a life-sized statue. Only a stone’s throw away at the edge of a sprawling municipal park along Libertad I stumble upon a magnificent city fair at which artisans in wood, leather, and glass displayed their wares. 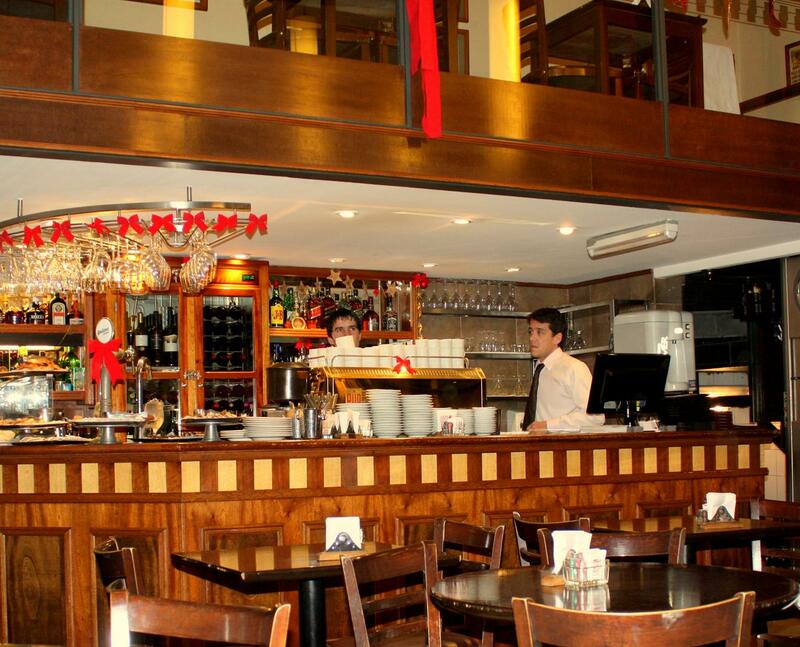 The quality and range of craftsmanship was stunning, and the mood of the place is equally uplifting. Young people gather in small clusters on surrounding grassy knolls, talking and playing guitars, and the overall feeling is a sort of flashback to 1967 San Francisco. Followed by my obligatory steak – tonight twin, butter-knife-soft beef loins – and Malbec, it is a great way to end the my first full day. I take advantage of Sunday morning’s traffic lull to visit the obligatory Microcentro tourist sites. 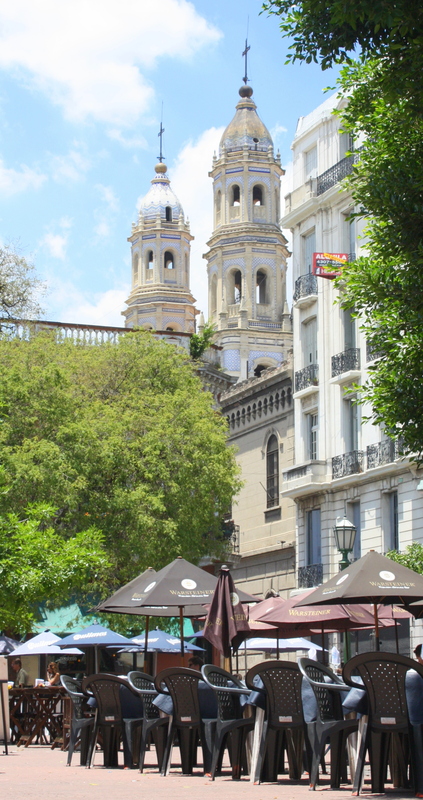 At the risk of sounding jaded, I find from city to city a certain repetitiveness to the church-government-monument school of tourism and if you hanker for the details of these in Buenos Aires there are plenty of tour books that will ably meet your need. 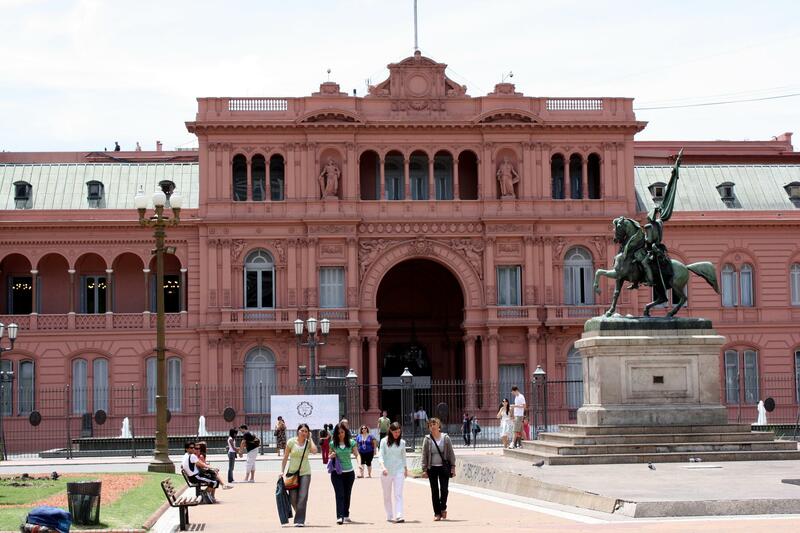 The national cathedral, the inevitable cabildo seat of Spanish colonial government, and the Casa Rosada contemporary home of the chief executive all conveniently face each other across the Plaza de Mayo. At least as interesting to me are the sights, sounds, and aromas encountered in the course of getting there and back from my apartment. I stick – as whenever possible – with a pedestrian point of view, which makes for a round trip of about 5 hours. 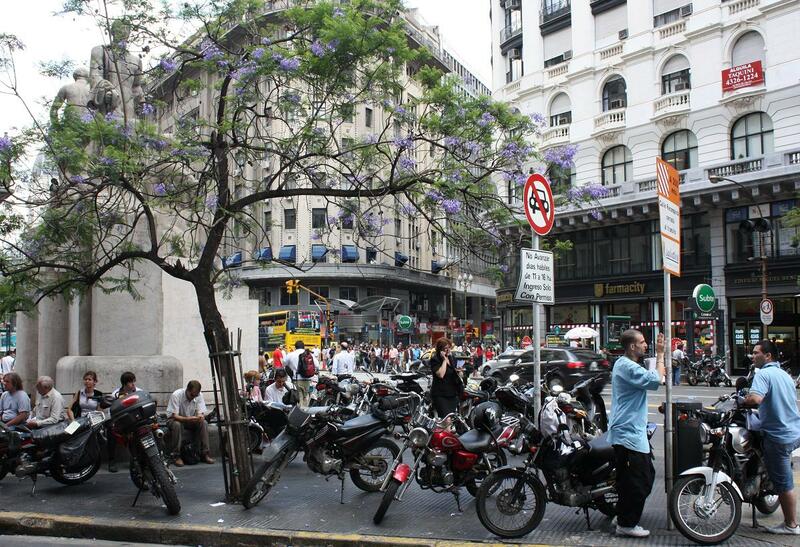 First there is the magnificent Avenida de 9 Julio, a broad boulevard for which opposing traffic is separated by a wide and beautifully landscaped median that was flowering wildly in this Argentine summer month of December. 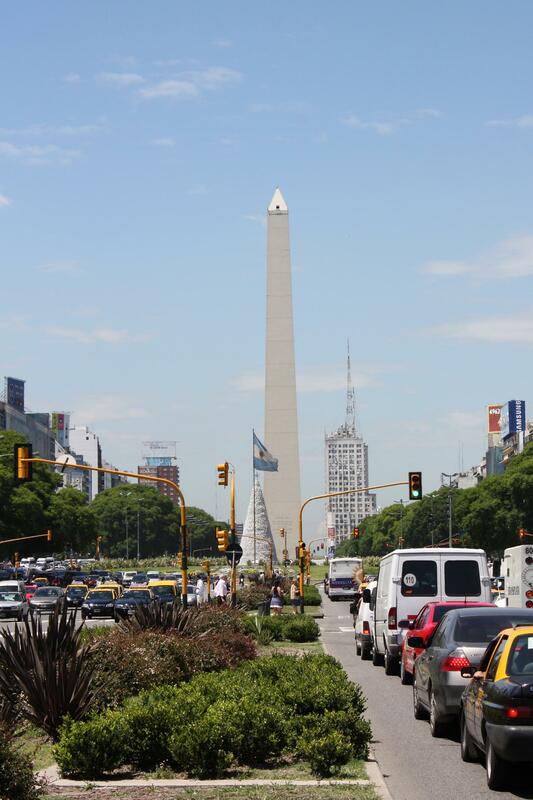 My impression of it as reminiscent of the Champs-Élysées is punctuated by the obelisk monument at its intersection with the Avenida Corrientes. Americans think instantly of its twin the Washington Monument, but it recalled for me also the Luxor Obelisk in the Paris’s Place de la Concorde. 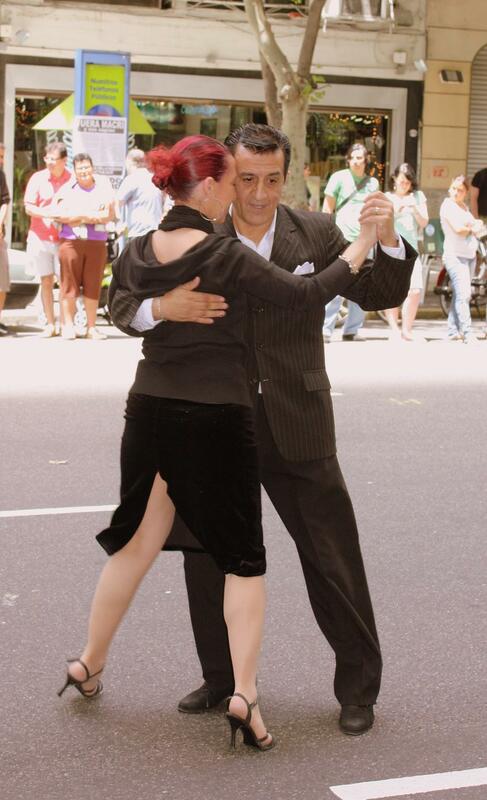 Next I encounter mid-street on the Avenida de Mayo – blocked off on this Sunday for foot traffic – an impromptu demonstration of the tango. Tango always recalls for me flamenco in its stylization, but while flamenco dancers of opposite sexes meticulously avoid contact even when within a hairs-breath of each other, tango dancers are sensuously bonded at every step. Behind the Casa Rosada I’m attracted by towering skyscrapers in the midst of which are the first construction cranes seen since my arrival. At their feet on the riverfront I find a renaissance neighborhood of loft apartments, restaurants, and marina not unlike those also making their appearance in the States. 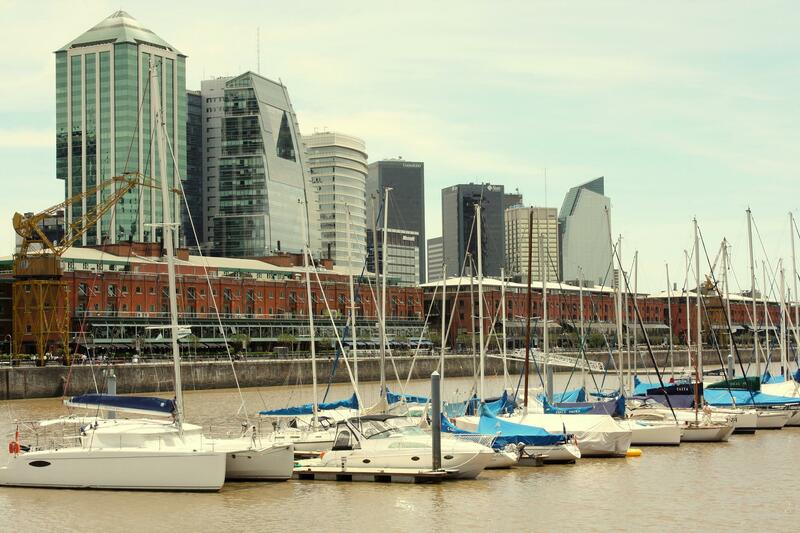 The district is called Puerto Madero. After half an hour or so, the mood is shattered when I come across a Hooter’s franchised restaurant and I beat a hasty retreat. Only a block from the urban Galleria Pacifico, a recent-model mall mercifully integrated into the structure of older adjacent buildings, I see a sight all too familiar in the States: a shuttered downtown department store. Upon closer examination, this one reveals itself to be the once-revered Harrods, and I paused in a moment of silence for this vanquished legacy. 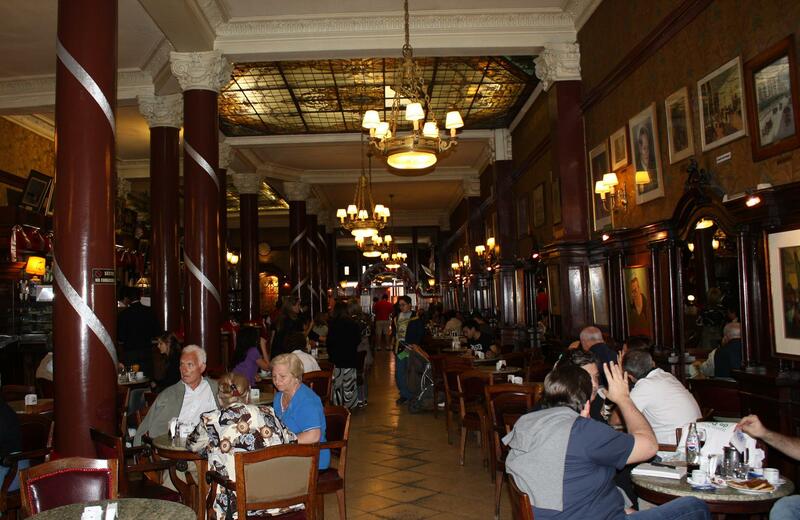 Last, but certainly not least, is the Café Tortoni, a Buenos Aires tradition dating back to 1858. Starbucks’ owners would blush with embarrassment at daring to call their places coffee houses if ever they set foot in this place. 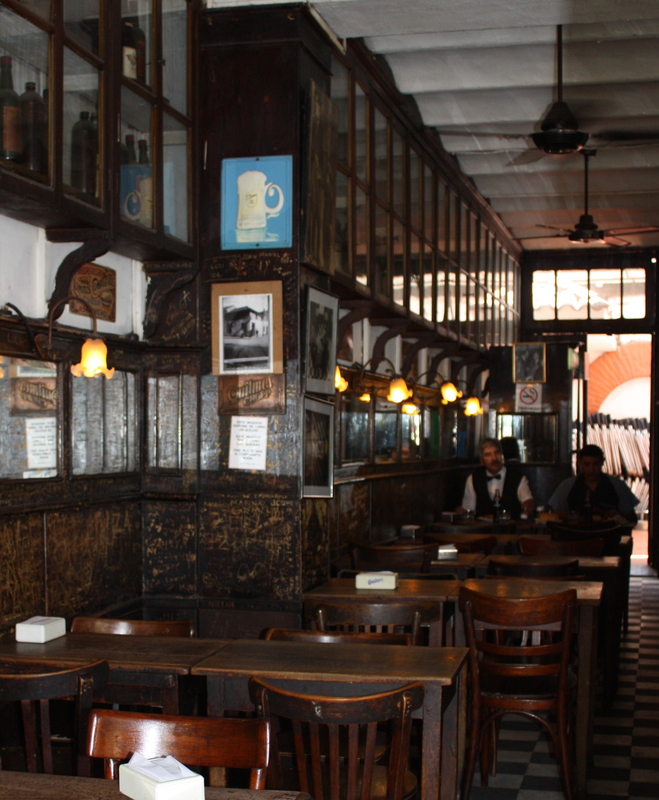 Café Tortoni harkens back to an era when artists and activists gathered in coffee houses to share and debate news and literature and politics. The decor evokes a Victorian drawing-room. Fluted columns rise to a high ceiling where light breaks through art nouveau stained glass panels. Tiffany-style lamps are scattered about like confetti. Dark paneling infused with a century and a half of cigar smoke lines the walls and encases the massive centerpiece bar. Most of the wall space above the paneling is covered with paintings and photos of celebrity patrons. The most notable of them appear at eye level as bronze and plaster bas-reliefs. Granite-top tables are encircled by heavy oaken chairs upholstered in red leather long ago worn to dark burgundy by the press of countless bodies whose shoes have worn rutted footpaths into the stone floor. Black-jacketed waiters in white shirts and black bow ties look to a man as if they have worked here for their entire lives. My waiter wags a scolding finger at my Canon and its obtrusive lens even as flashes from tourist pocket cameras are going off behind him. I order a Cappuccino Italiano and churros, and pull out my notebook to write this picture. The economic roller coaster that Argentina’s been riding in recent years has a silver lining: It may at this moment be the only civilized place on the planet where the American tourist dollar still has big clout. It’s almost an embarrassment of riches. A taxi ride from the airport that would cost just well over US$50 anywhere else weighs in at well under US$35. My first evening’s dinner – which includes a boneless steak the size of a New York strip on steroids and two glasses of the priciest Malbec on the menu, comes in at just about the same price. 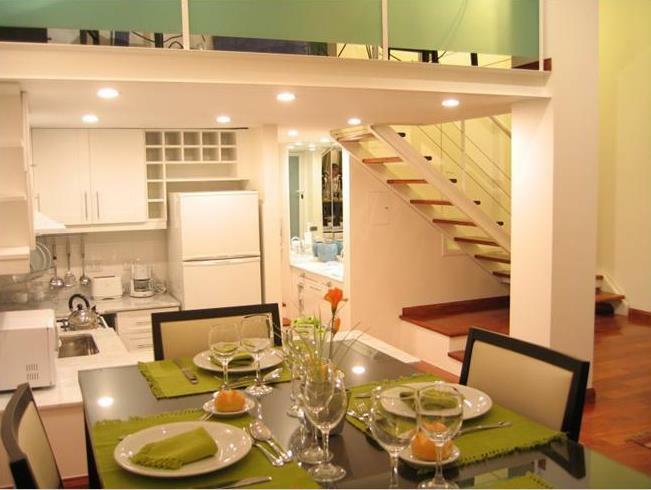 My pied-a-terre – a neat little apartment in the chic Recoleta neighborhood with full kitchen, loft, wi-fi, cable, local phone, and night doorman – runs barelymore than US$100/day. 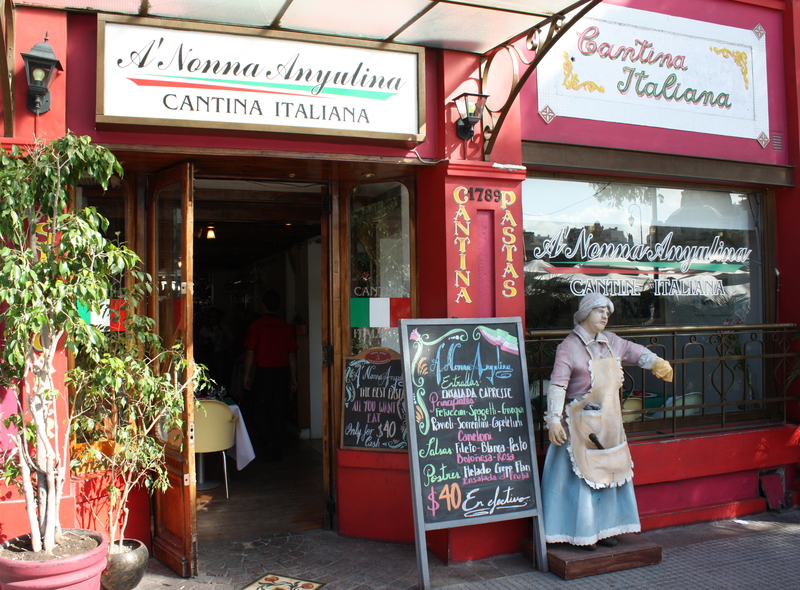 None of this would raise an eyebrow for any third-world tourist destination, but I am quickly finding that Argentina delivers a remarkably European experience at banana republic prices. The embarrassment part comes from noting on the ride into town that – notwithstanding the absence of street people or other obvious signs of hunger or unemployment – there appears to have been almost no new construction here in a good 20 years, and the exteriors of too many buildings look like they’re 4 or 5 years behind on their last coat of paint. While things here don’t even remotely resemble the backward slide of depressingly faded Odessa in the former USSR and look a hell of a lot better than metropolitan Detroit, it’s also clear that the economy has been in an extended stall. Perhaps the real silver lining is that B.A. is clearly inhabited by people who have clung tenaciously to a joie de vivre and sense of style despite all obstacles. The airport taxi whizzes along a thoroughly modern autopista amid only moderate traffic to deliver me downtown in little more than 20 minutes, but it takes nearly twice as long to travel the final 5 miles through congested downtown traffic that made rush hour on 5th Avenue look like an orderly evacuation. Along the way we pass subway stations of the several lines that criss-cross the capital, beautiful parks and classic monuments, and the distinctively Latin American incongruity of a Pierre Cardin storefront abutting a staircase door leading up to the headquarters of the local Communist Party. 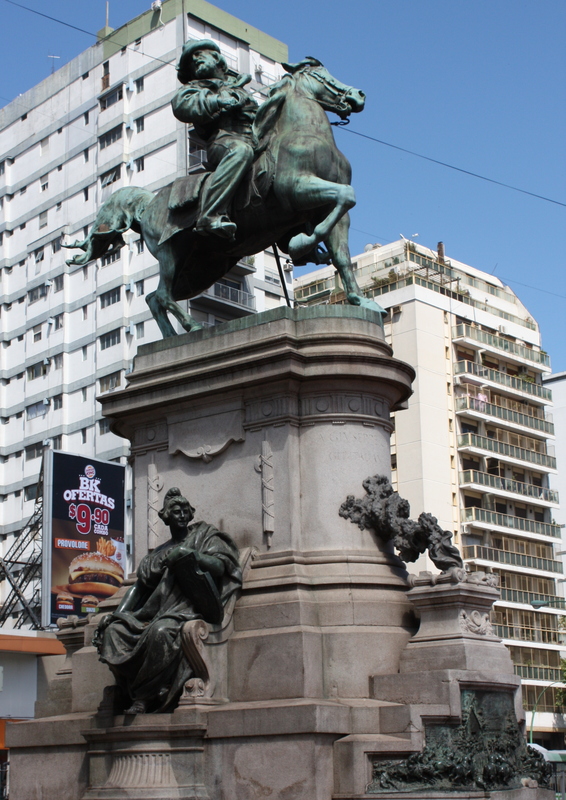 We also pass through the intersection of the Avenida Juan Peron, leading me to reflect on the seeming paradox of Continental cultures now considered bulwarks of democracy and civil society that have also bred some of the 20th century’s most heinous dictatorships. Peron was actually quite tame compared to the cabal of generals who followed him at the decade’s end to create tens of thousands of the Disappeared. It took the French the better part of the century following their Revolution to get democracy right, and it took the Americans to seed it firmly in Germany, Japan, and Italy. Is it culturally insensitive to observe that democracy seems in its most successful incarnations always to have in its DNA a sturdy Anglo-Saxon thread? The La Recoleta neighborhood lies not far from B.A.’s Microcentro” ground zero, and it is one of those glorious old Belle Époque era neighborhoods that retains its sense of elegance and charm, a grand dame weathered at some intersections a bit by the passage of time but nonetheless still a very classy lady. 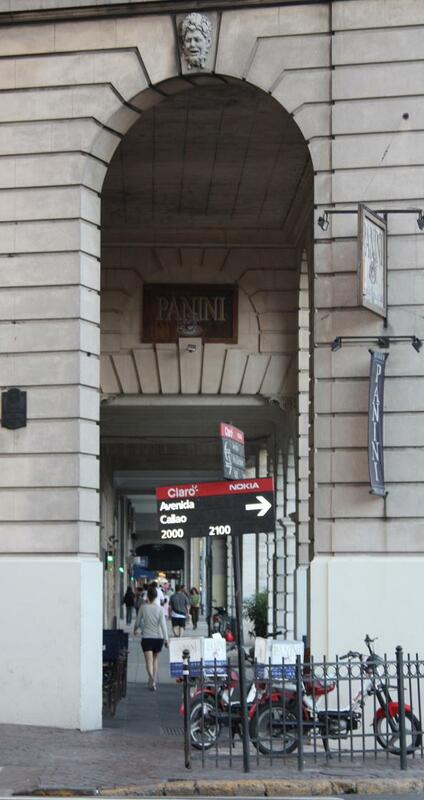 It reminds me instantly of Paris’s Montparnasse, the upper end of Barcelona’s La Rambla, or Rome’s Via Veneto. I’ve always had a disdain for chain hotels that keep foreign visitors tethered to a sort of Epcot Center experience. 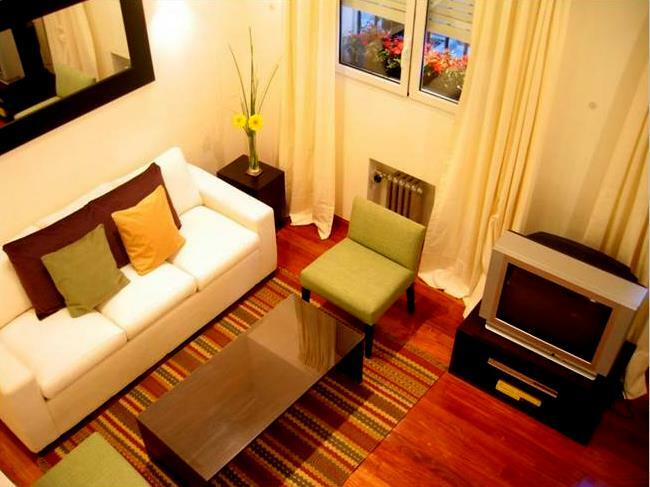 Beginning with a visit to Paris almost a decade ago I quit staying even at quaint boutique hotels and instead rented for the first time a small apartment. It was gloriously situated just a block off the intersection of St. Germain and the Boul Mich, and I’ve been hooked on the foreign apartment rental experience ever since. 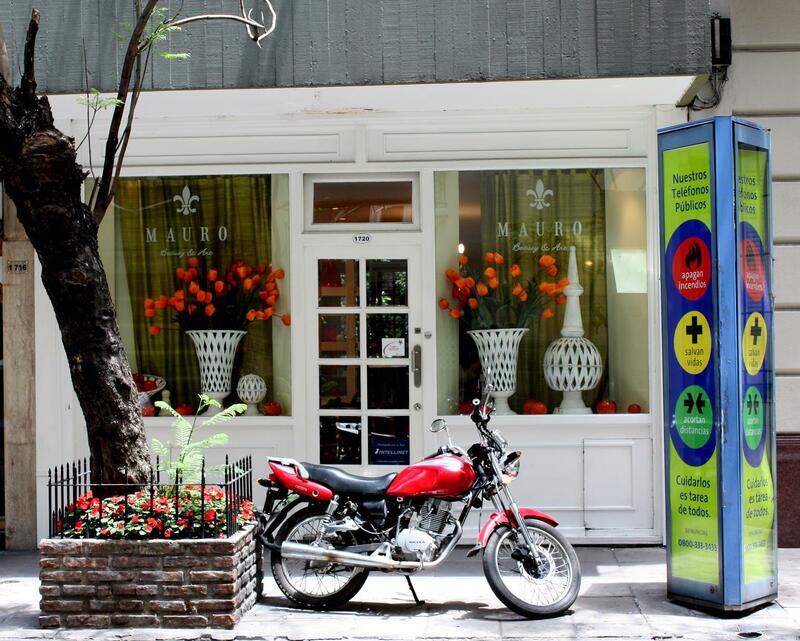 This time I reach out to the folks at Buenos Aires Habitat (found them through TripAdvisor) and I couldn’t recommend them more highly. 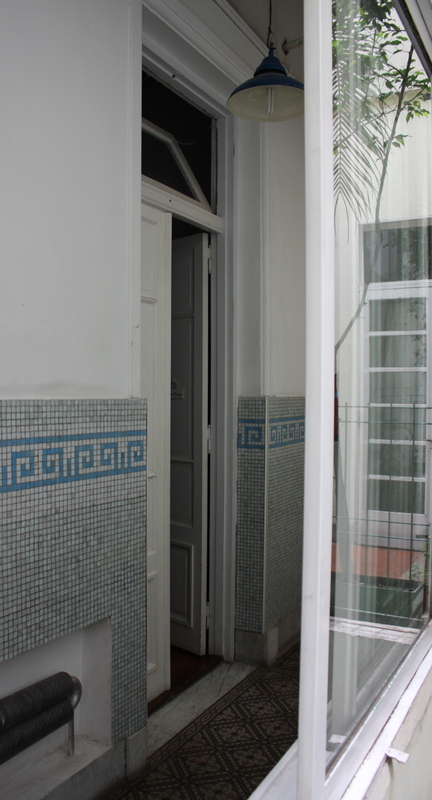 Tomas – who recently completed his PhD in tourism and who speaks impeccable English – greets me upon arrival and walks me through every detail of the apartment and the surrounding neighborhood with the care of a good friend lending me the keys to his place for a long weekend. Delfina – whom I’ve met only via email but talk with by phone shortly after my arrival – guides me here from the States with the presence of an air traffic controller talking a pilot down for an emergency landing. Her associate Eugenie makes complete arrangements for a side trip to the Mendoza wine country later in my stay and drops by to personally confirm arrangements. Tickets and drivers to/from each site and transportation hub are all arranged. It’s pretty much like the very best concierge service… except delivered as a house call. I have to confess that I cheated my effort to switch fully over to local time on the first day and instead grabbed a short nap late in the afternoon. Eugenie had recommended a bistro only two blocks away for a light meal and her intuition was yet again perfectly on target. The restaurant Liber strikes me instantly as one of those perennial local favorites which seems to have an offering appropriate for every time of day and every occasion; I shortly learn from my waiter that it is open 24/7. Tables between sidewalk and curb are covered end to end by the structure’s overhang to create a sort of outdoor dining gallery where all tables are empty as I enter around 9 thinking that a slight evening chill has driven everyone inside. The place is bright, but the light is warm and inviting as the dark and well-worn paneled bar and cabinets. The floor is a pattern in fitted stone broken unobtrusively by colored tile designs. I pick out a corner table well-positioned for people-watching and I am not disappointed. I am upon entering one of three lone diners later joined by another, the lot of us spread across 20 years or more in age. By evening’s end one leavest accompanied by a woman with whom he has clearly scheduled a rendezvous and the other finishes reading a stack of the day’s papers. The remaining tables are occupied by mix of couples, a girls-night-out trio of middle-aged ladies, and mixed companies of friends. It’s clear that this place has its regulars. By the time my meal winds down, the patio begins to fill up – also with apparent regulars – in the Spanish tradition of late night dining; apparently only this lone Yanqui feels any chill in the air. I’ve already recounted early on a bill of fare that ends with perfectly brewed cappuccino, but the account would not be complete without mention of an eye-popping display of elegant, freshly-baked pastries ranging from delicate petit-fours – served gratis with after-dinner coffee – to elegant cakes. It may be the first time I’ve been able to resist such a mother-load of carbs and I feel on the morning after somehow cheated by my restraint. The sky has already gone black and the air is crystal clear as my plane points its nose up the East River on the approach to LaGuardia. Above the Battery I can see amid the lights of lower Manhattan a muted pocket where the twin towers once stood. Chinatown and Little Italy and Greenwich Village are pinned to a catty-corned grid that butts anarchic against Midtown’s stolid blocks. Empire State and Chrysler Building beacons sit stately between them and the dark patch of Central Park. Far beyond corporate jets spiral upward and downward around Teterboro and the lights of Yankee Stadium curiously blaze long past season’s end. 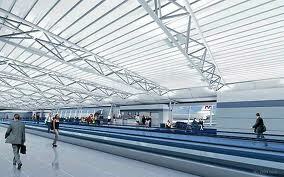 I linger not long in LaGuardia’s cramped, familiar spaces before I jump the shuttle to JFK . It must be close to 10 years since I last strolled through Kennedy, its bright and modern and expansive and polished spaces a sensory-rattling contrast with those of its older cousin. (Does anyone still remember when it was once named Idlewild?) Sliding walkways course down medians of broad pedestrian boulevards past duty-free shops as world-wise passengers wait sagely in spacious lounges, well-mannered and well-dressed. My Spanish-speaking America has until now ended at the Caribbean, where dark eyes and brown skins and flat, broad noses of native ancestors run like a thread through tapestry seas of faces. The faces of this evening’s Argentine human cargo almost without exception recall instead those from the streets of Milan and Barcelona and Vienna and Alsace; there is in them only the Old World. As we await departure the Cleveland Browns are – much to the surprise of almost everyone – beating up on the Pittsburgh Steelers and my Ohio childhood flashes back as the camera cuts away to lakeside stadium light exploding into a night sky bordered by the the stack of Terminal Tower windows. Flying to Europe is like running out to the 7-Eleven compared to the flight from New York to Buenos Aires. Inside the cocoon of the wide-bodied hull, the dining auditorium has dimmed into a dormitory dotted here and there by bright seatback video screens. The line on the digital flight map sunk into the seatback facing me creeps for long, dark hours over unseen ocean before we at last slip past Puerto Rico and the Windwards. Ahead is Venezuela and the faded, flanking memory of Jonestown, Guyana. Beyond them are only vast hours of rainforest and totally unfamiliar names as we sail like Columbus reborn past the edge of my known earth. 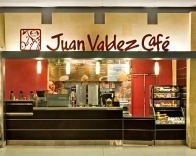 It is totally out of character for me to drink coffee after noon – or to consume much caffeine at all – but just before departure I ingested a generous cup of the real deal at JFK’s Juan Valdez Cafe in an attempt to shock my biorhythms into synch with those of nocturnal Buenos Aires. As the caffeine courses through my veins I surf the seatback video menu into the wee hours until I finally doze off into fitfull sleep. Upon my awakening soft white light leaks through the cracks at the bottom of drawn window shades. Below us the rain forest cloud canopy rolls from horizon to horizon like densely packed gray cotton. 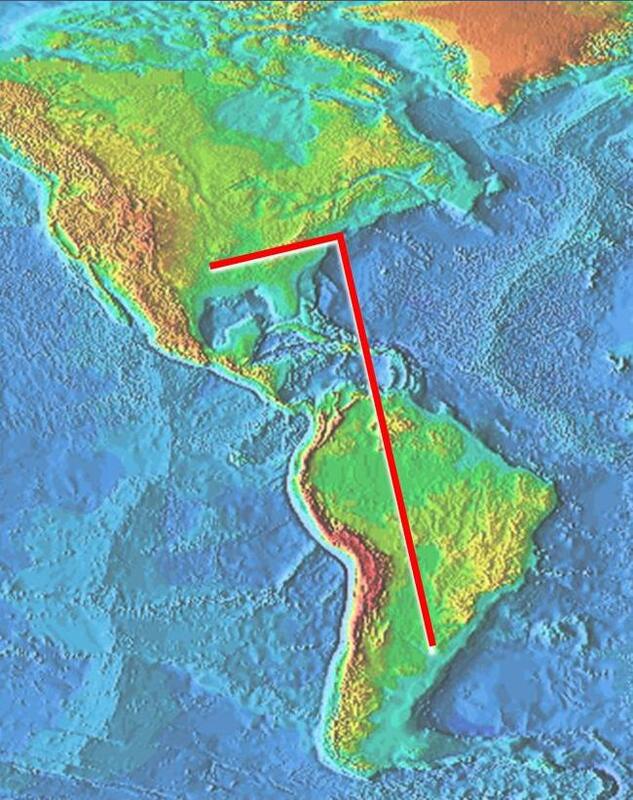 The Amazon River already lies three hours behind us as the toy plane on the seatback map speeds over verdant forests and the rugged tan wall of the Andes rises a thousand miles to the west. Buenos Aires lies yet three hours ahead and two time zones east of “Nueva York”, where my errant baggage awaits the next flight out in chase. 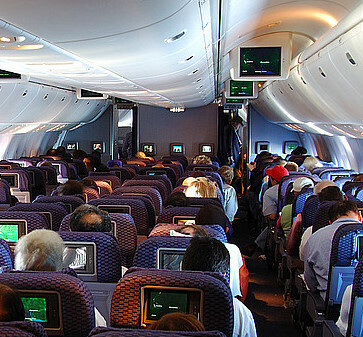 The seatback screen says that we are eight miles high and that outside the temperature is minus 60 degres Fahrenheit. I once read that skydivers with failed chutes die of heart attack long before they hit the ground. Through my mind now passes the question of whether a man falling from this height would first die of suffocation in the thin air, and if his flash-frozen carcass might shatter on impact. We pass over Asuncion, Brazil and the dense, rolling clouds have become an opaque haze. The plane on the seatback map makes a turn and in its horizon view Buenos Aires sits on the wide mouth of the Rio Plata estuary across which Juan and Eva Peron once fled Argentina before their triumphant return. We descend over the dense metropolitan sprawl in a wide arc that carries us out into the countryside and at last down to the tarmac nearly an hour from the heart of the city.